The Patriot Memory Burst SSD 240 GB SATA III internal SSD is the best device which helps you improve the overall performance of your computer. The burst SSD provides the perfect speed for transferring your data also provides the best experience in gaming. This includes SATA III 6 Gbps interface which offers improved performance than the other external hard drives. It will work excellently connecting with any laptop or notebook. The fastest speed at a very low price sets new standards in the market with its award-winning quality and ultimate performance. 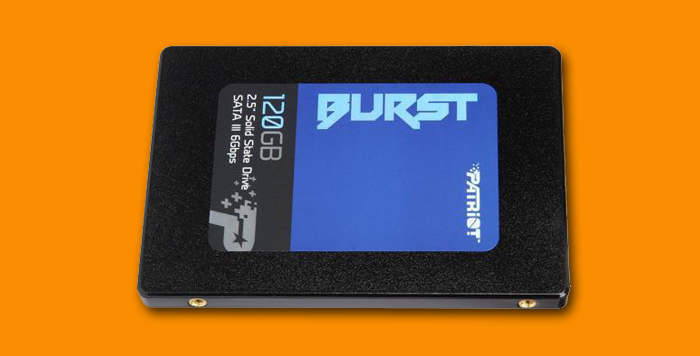 So, Patriot Burst is the most efficient pick from the family of SSDs. The most admirable features of this Burst SSD 240GB is the phison S11 series controller and the low power management. The Phison S11 controller is a single core controller. It helps in delivering the master performance and it can support two channels. The Phison S11 controller features Smart flush, Smart Zip, power saving, and an end to end data path protection. When we look at the package design, they are still using the same packing design. In the box, Patriot burst is packed in a plastic cover which is hard, a user manual, and a three-year warranty card. This flawless drive is 7mm-thick, and 2.5 inch SSD, so it can be fit in any computer and laptop which has a 2.5 inch hard drive. It is packed with flawless features like static and dynamic wear leveling. Wear leveling is the specific type of method which increases the life cycle of services of some erasable storage devices like flash memory. Mostly it is used by an SSD, USB drive or any phase change memory. And the most impressive is Trim support. Trim support blocks the data which is not used for a long time and wiped it internally. 240 GB SSD with Phison S11 Series controller included. Support multiple operating systems like WinXP, Vista, 7, 8, 10 and also Mac operating system. The Patriot Memory Burst SSD 240 GB SATA III internal SSD drive is much-appreciated device because it delivers exceptional performance. It provides the fastest speed of reading and writing. It is faster than any other external drive in the market. Overall, it is perfect for those who need an SSD which can provide wonderful experience and performance at a low price. It features exceptional transfer speed with 555MB/s. It also speeds up the loading process of an application and a nice choice for those who need an SSD for gaming. This Patriot Memory Burst SSD Review covers everything about this SSD.